For many, autumn signifies one thing alone: the seemingly inevitable loss of hair, dwindling from your scalp with the simplest nightly brushing. It’s lamentable at best. For others, it causes a great deal of stress. If the weather isn’t directly related, you may be at your wit’s end wondering what could be causing your scalp to thin so much. Sometimes even the best sulfate free shampoo can’t help! While there are all sorts of answers to this question, not all of them should be believed. Here is our list of some of the worst hair loss myths, as well as the truth about them. This myth comes from the belief stress has major negative effects on your scalp and hair health. However, while commuting and the inevitable traffic jams are certainly stressful, they aren’t quite enough to cause you to lose hair. You have to be going through much worse trauma for your hair to reach that point. Actual causes of stress-related hair loss can include sudden and intense dieting, childbirth and severe illness. Sometimes even the best sulfate free shampoo can’t help. The reasoning for this myth may lie in all the chemicals you have to use to render your hair the perfect shade, whatever that may be for you. However, with the help of some of the best sulfate free shampoo, your strands will be pretty safe! It isn’t simply dyeing your hair that can cause it to fall out. Rather, it’s the quality of your hair care that ultimately affects your hair health. Experts prove it isn’t the type of products you use on your hair, but their frequency of use. Whether you’re fond of braiding, straightening or a favorite brand of dye, you likely know and understand the toll this can take on your hair. If you take the proper steps to keep your hair strong to make up for chemical and heat exposure, you won’t have to worry. In other words, many believe hair loss is entirely genetic. Science once again debunks this myth by proving baldness depends on a little more than a specific line of genetics. Rather, it’s a whole host of genetic jumbling and other factors that can lead to your hair falling out. If you have several family members who’ve lost hair during their lives, there’s a good chance it’ll happen down the line for you. However, if it was only your grandpa, there’s no need to fret. Keep using your trusty bottle of leave in conditioner and you’ll be fine! These are only a few of the myths surrounding hair loss. Many more float around on the Internet and other means so you’ll have to learn how to distinguish truth from fiction. 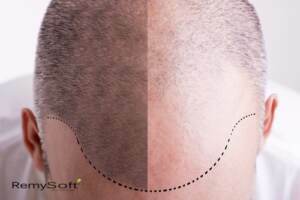 If hair loss currently plagues you, we suggest you consider looking into full cap partial cap hair replacement to give your hairline a helping hand. For any other questions about hair loss and general hair care, contact us! A Step-By-Step Guide to Picking Out the Best Wig for You! No matter your reasons, the process of choosing a wig is undoubtedly a nervous event for many. There are so many styles and options the simple act of browsing can be overwhelming. You may wonder, “What type of wig works for me? What color should I get? What style suits my face shape best? What about quality?” We fully understand your concerns! That’s why, to help you know what to look for, we’ve put together this handy shopper’s guide just for you! 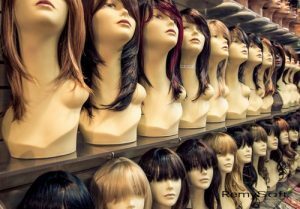 Before you go into any other detail of your wig shopping journey, you should first find the perfectly styled wig. You can base this judgment off a number of factors, from your facial shape to the weight of the wig to your comfort level and most importantly, your own personal preferences. You ultimately want to choose a wig that makes you both look and feel great! There are all types of lengths and textures to choose from,so don’t be afraid to experiment! After you’ve picked out the perfect style of wig for you, you want to be sure it will fit on your head! Luckily, wigs come in a wide assortment of sizes and can even be altered to fit better. You will have to do some measuring to figure out your cap size. This step will involve measuring your head to get its circumference. Be sure to start with your hairline and wrap your measuring tool around your head until you wind up back where you’ve started. This is the best way to get an accurate measurement. What Will Your Wig Be Made From? Be sure you use wig shampoo and conditioner. The material of your wig is just as important as its size and style. You want only the best looking wig, as well as the most convenient type for you. Wigs can be made from two materials: synthetic or real human hair. 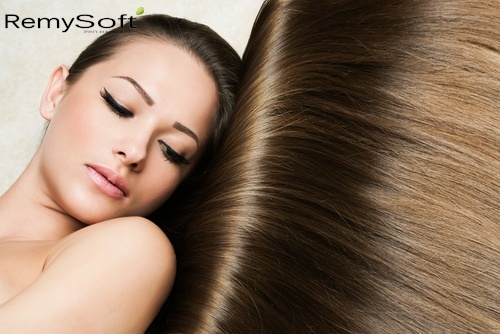 While synthetic hair is made to feel natural, they don’t beat out human hair in that regard. Synthetic wigs are best for those on a budget and who don’t want to spend a lot of time on styling. These wigs can be worn for up to six months. Human hair wigs will automatically look realistic and are the best option for those who want to style their wig frequently. While it’s pricier, it’s well worth the amount! Human hair wigs will keep for at least a year. No matter which wig style you choose, be sure to look into the right wig care products. Now would be a good time to invest in wig shampoo and conditioner! Color may be the last part of our guide, but its important isn’t! Wigs come in an incredible variety of colors, from bright, unnatural hues to shades identical to your natural hair color. What color you choose is up to you and your preferences. 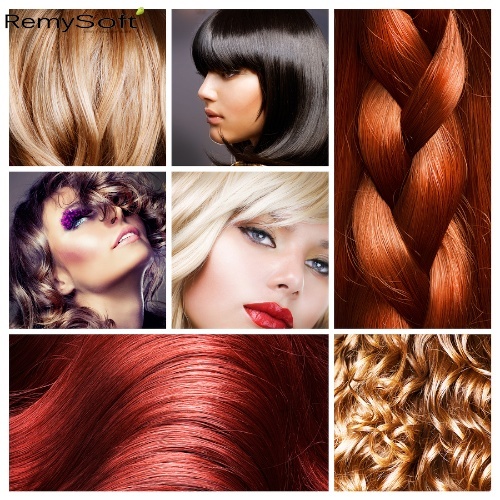 No matter which stage of the wig buying process you’re in, we at RemySoft are here to help you! We carry a vast array of products designed to keep your new wig, including full cap and/or partial cap hair replacement, beautiful for longer. To learn more, contact us! Hair products for remy hair help take care of your hair. Admit it. Even though you don’t want to talk about it, it’s still at the back of your mind. When you start to experience thinning hair and begin to worry about going bald, it’s time to learn about full cap and partial cap hair replacement options to help you maintain a more youthful look. Before you get to this point, it’s necessary to learn what to look for and how to care for synthetic wigs with hair products for remy hair so you can be prepared when the time does arrive. 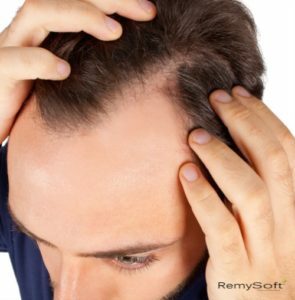 Your hairline is often one of the first areas of the head in which thinning hair takes place. 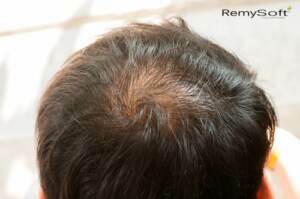 While there are exceptions, many men who become victims of male pattern baldness will begin to see thinning or lost hair in the area of the temples. The hair loss will then progress to other areas of the head. However, if you have longer hair in this area, it can sometimes be difficult to notice just by looking in the mirror. To ensure you catch balding in its earliest stages, be sure you frequently pull your hair back to check this area for the beginning signs. 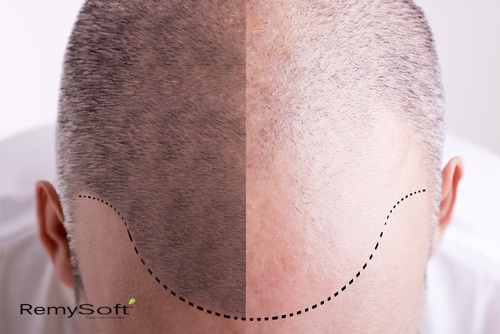 While you typically can’t stop bald spots from occurring, you may be able to keep your hair in good condition for longer. Use hair products for remy hair that don’t contain sulfates because these and other chemical ingredients can actually cause damage to your hair that contribute to thinning. These products won’t be able to fully stop or reverse the signs of going bald, but they can help keep the rest of your hair healthy so you can look and feel younger. Full cap and partial cap hair replacement can help. Many men think wigs are for women, but this isn’t the case. Full cap and partial cap hair replacement options can give men the illusion of a full head of hair without making them look or feel too feminine because they’re wearing a wig. As long as you know how to care for synthetic wigs, you will find it lasts a long time and looks natural so no one has to know you no longer have a full head of natural hair. Going bald is nothing to be ashamed of, but that doesn’t mean you shouldn’t be concerned about it. 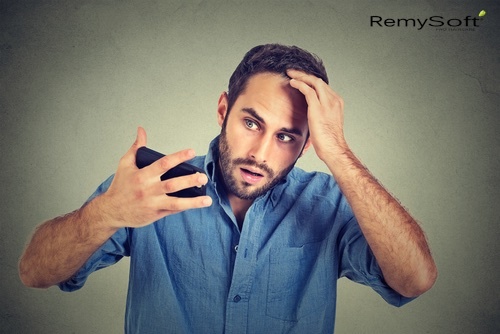 Many men begin to show the signs of balding as early as in their 20s, which is why it’s important to start checking and keeping an eye out for any changes. When you pay close attention to what’s going on with your hair, you will be able to address the issues and get help quickly so you can maintain your youthful appearance for longer. If you’re looking for quality hair care for your hair replacement pieces, contact us. We carry a full line of hair products for remy hair to keep synthetic and real wigs looking great for longer. Wigs have an important part in history around the world. Most people know wigs are a popular option for those who are unhappy with the look of their hair; however, wearing wigs is not a new trend. In fact, using wigs as a hair enhancement has been a common practice in many cultures throughout history. On the other hand, in ancient cultures, such as in China and Japan, hair enhancement wigs were only used by actors performing in theaters or worn for ceremonial traditions. During periods of Christian influence, wigs became less popular as women were often required to cover their heads. Beauty became less ornamental and more austere, leading people to use less makeup, hair enhancement and fashionable clothing to keep themselves looking good. After the beginning of the Renaissance, however, women started adorning their heads and hair with veils and sparkling jewels. 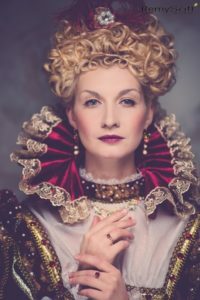 The increased attention to their hair led many women to wear wigs that featured elaborate hairstyles, such as curls, braids and other styles that would be difficult to fix every day. Perhaps the most famous examples of hair enhancement come from France and England. In France, the trend started after French leader Louis XIII began prematurely balding. To disguise his condition, he began wearing partial cap hair replacements. Eventually, wigs and other full cap hair replacements became essential fashion pieces for members of French high society looking for big, curly and elaborate hairstyles. In the same way France’s leaders popularized wigs, England’s Queen Elizabeth also made hair enhancements popular in her country. Wig making became a lucrative profession during her reign because most court-going citizens used them to be in style for everyday events and balls. Large, powdered wigs were essential additions to any wardrobe of the time. Although wigs are not quite as popular now, they are still used by many people to cover medical conditions like balding or add more to existing hair styles. Full and partial cap hair replacements allow many people to cover their heads with confidence and improve their looks. If you are looking for stylish hair enhancements, contact us. We have the experience needed to provide you with the latest style, care and product information to keep your wig looking great! A hair system can transform your look. Whether you are looking to change your hair style or cover hair loss from a medical condition, wigs are a great option to help you look your best. With so many styles and options to choose from, it can be difficult to make the best decision. If you are looking for the right full cap hair replacement, there are some things to keep in mind to make your decision easier. Depending on how you will use your hair, you may want to look into either option for your full cap hair replacement. For example, if you are only using your wig for a short time, it might not be worth paying for a human hair wig. To get the most comfortable fit, select the best cap for your needs. Caps can either include hand stitched options, or you can even choose a wig without a cap. Capless hair systems use a honey comb design and offer better ventilation. Some options are more comfortable for different wearers so make sure you try each option before making your choice. 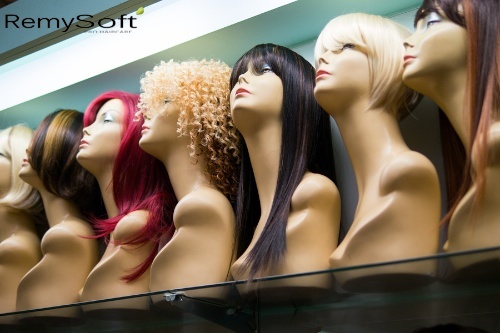 Different wigs can weigh more or less, depending on the size, material and length. Human hair wigs weigh more than synthetic hair systems, and long wigs can be heavier as well. Because wig weight is important in determining comfort, try different styles to ensure the one you select won’t be too heavy and hurt your neck or head. If you are looking for more tips and tricks to make wig shopping easier, contact us. Our professional staff provides the best information on selecting, caring for and wearing your new wig. A full cap hair replacement can often be your best choice. If you are looking for a full or partial cap hair replacement to add to your existing style or cover medically related hair loss, choosing the right wig may seem confusing and difficult. With so many options available, you may struggle to narrow down all of your hair enhancement options. To make the best decision for your new hair, there are a few things to consider. If you don’t know your face shape, use your measurements to determine which wig would look best on you. Wig experts can also help you determine which hair enhancement would best highlight your features. It’s important to consider your lifestyle, hobbies and profession when choosing a full cap hair replacement. If you work in a professional office, you may need to consider natural colors, rather than bright, unnatural looks. For those who work in the heat or humid environments, full or partial cap replacements made from human hair can easily lose their style; synthetic hair may be a better choice in this case. You should also consider how much you’ll need to touch your wig. If you go to the gym every day and need to put your hair up, for example, you might want to look for wigs that are easily styled on the go. One of the most important factors when choosing a hair system is fit. Wigs that are too large or small for your head fall off easily, which could be embarrassing for everyone involved. To avoid such mishaps, measure your own head or seek the advice of a wig expert to make sure your hair enhancement fits properly and won’t cause any problems. With so many style options available for full cap hair replacement, it’s essential to find the color that looks the best on your skin tone. Consider the natural color of your hair, eyebrows and eyes to find the perfect match for you. For the latest information on wig care and other hair enhancements, contact us. Our professional stylists are here to help you choose and care for your wig.